﻿Maundy Thursday: Calendar, History, Tweets, Facts, Quotes & Activities. Some Holy Thursday services include stripping of the Altar, held in church. It's an ancient practice that represents the abandonment an desolation the disciples felt after Jesus was arrested. Designated people take down all decorations and the Bible for the church sanctuary. The items will be put back Easter Sunday morning, sometimes in a procession. Into each of our lives Jesus comes as the bread of life... to be eaten, to be consumed by us. Then He comes as the hungry one, the other, hoping to be fed with the bread of our life, our hearts loving, and our hands serving. - Mother Theresa of Calcutta. Foot-washing celebrates the servant hood of Jesus. The word Maundy comes from mandatum novum in Latin, new commandment, which refers to the scripture found in John 13:34-35. After Jesus washes the feet of his disciples, he says, A new command I give you: Love one another. As I have loved you, so you must love one another. By this everyone will know that you are my disciples, if you love one another. The words used in Holy Communion reflect what Jesus told his disciples: Take, eat. This is my body broken for you. Do this in remembrance of me. … Drink for this, all of you. This is my blood of the new covenant, poured out for you and for many for the forgiveness of sins. Do this, as often as you drink it, in remembrance of me. Take a close look online of Michelangelo's The Last Supper . Notice what each of the disciples is doing, and how Jesus is portrayed. 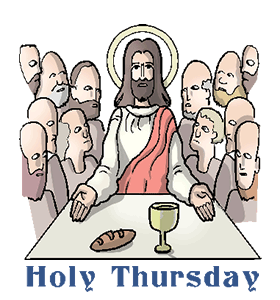 Attend a Holy Thursday service. Some denominations, such as Roman Catholicism, require you to be a member to be given communion, but many Protestant Churches do not. Participate in a foot-washing service. This puts many people outside of their comfort zone. Washing someone else's feet is an intimate act, but it was the lowliest act that a slave in Israel performed. It demonstrates ability to love and serve others. Watch The Greatest Story Ever Told (1965) with Max von Sydow as Jesus. Pay attention to the Last Supper scene.